Many African Americans don't know where their ancestors are from due to the transatlantic slave trade. They're increasingly using DNA test kits, like those manufactured by 23andMe, but aren't finding complete answers. It took nearly 30 minutes for Eric Depradine to extract a saliva sample from his dying grandmother. Depradine, 35, of Kansas City, wanted to have his grandmother’s DNA tested to confirm his suspicions that her ancestors came from Madagascar. He’d read author Michael Twitty describe in "The Cooking Gene" how African Americans who lived in eastern North Carolina — like Depradine’s paternal grandmother — very likely descended from Malagasy people, an ethnic group in Madagascar. 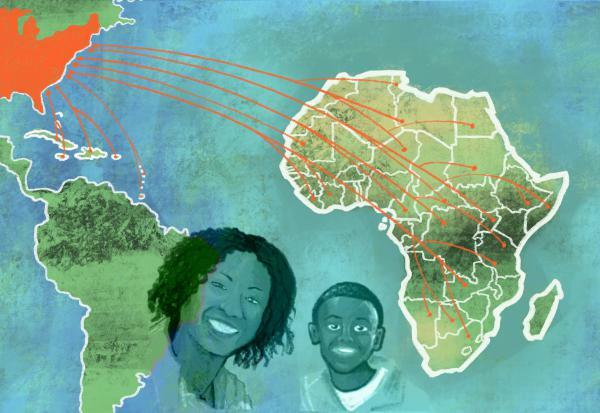 African Americans often have scant knowledge about where their ancestors are from, so many are using DNA test kits, like 23andMe and Ancestry, to trace their roots. The transatlantic slave trade erased a lot of information about family history and countries of origin for many people descended from African slaves. “There’s no value you can put on a DNA test when you’re researching your family history as an African American,” said Crystal Williams, an East St. Louis resident. St. Louis Public Radio's Eli Chen reports on the experiences of four African Americans who used DNA test kits to learn about their ancestry. The results alone don’t provide a complete answer, Depradine said. Kathleen Brandt, a professional genealogist and private investigator based in Kansas City, sees many African American clients who are seeking information about their ancestral origins. She advises all of her clients to have their DNA tested. When paired with records containing information about slave owners and emancipation, DNA tests can help kickstart a search that has helped her find out which ship or slave port was involved in transporting a person’s ancestors to the Americas, Brandt said. It’s an essential tool, especially since enslaved people often changed names, which can make research difficult. Some, who had surnames that were the same as the plantation owner’s, changed their names when they began working at a different plantation. They may have also called themselves something different when they became emancipated, she said. Some DNA tests are also limited in how far back in time they can reach. That’s why FamilyTreeDNA is more preferred than Ancestry and 23andMe, which can only go back five generations, Brandt said. The tests don’t always give a definite answer when it comes to ethnicity. As more people submit their genetic materials to DNA test kit companies, the results can change. Brandt warns her clients not to become too emotionally invested in their results. Yasmira Emofor, also of St. Louis, experienced similarly tense moments with Africans. Nigerian people in particular would insist that Emofor was Nigerian. Holman’s search was more complicated. While her geographic knowledge of her mother’s family line stops at Arkansas, she knows her father’s parents came from Jamaica. But the country is more a part of her national identity than an ethnic one, she said. “I think we all still understand there is some part of the diaspora involved where the Jamaicans were brought over from one of the countries on continental Africa,” Holman said. A more recent and major reason that motivated Holman to buy kits from Ancestry for her parents were aggressive remarks people would make to her when she’d comment on politics. When her father’s test results arrived, it showed that the country with the largest percentage was Nigeria, about 40 percent. However, she logged into his account a year later and found that the percentage for Nigeria dropped to about 3 percent, and that Cameroon and the Congo increased to more than 50 percent. Among some African Americans, there is a commonly held myth that their families have some Native American ancestry, said genealogist Kathleen Brandt. When she does genealogy presentations for an African American audience, about half of the attendees will claim having Native American roots. "I was also told that we had Native American ancestry and we don't have a drop. I've got the records to prove that," she said. "If you can't follow a paper trail, you are not Native American." African Americans will have a far greater percentage of European ancestry, Brandt said. When Depradine also found that his grandmother has European ancestry, he probed government records to identify a few white men, some of whom were Quakers, who he is distantly related to. Given the brutal history of the slave trade, he wasn’t surprised to find those European roots. Crystal Williams, of East St. Louis, also was able to trace her ancestry to several European countries including Spain, England, France and Germany. She found it disconverting to confront the reality that her own ancestors were owned — an emotional cost that African Americans must bear when seeking information on their family history, Williams said. Williams plans to take a month off of work soon to travel to some of the countries listed among the DNA tests she’s taken, including the European countries. Her results placed her ancestors all over Africa, but she’s not dissatisfied with having an incomplete answer about her ancestry. “I think I can at least get back to maybe where the ship [carrying my relatives] docked, and that’s good enough for me,” she said. Since his grandmother’s test, Depradine has collected many paper records about his relatives to see how far his family tree extends in the U.S. He’s motivated to use that research to share a rich family history with his children.